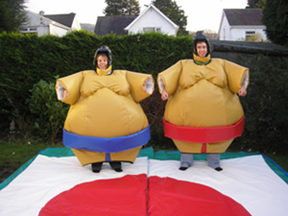 We provide sumo suits for hire in the Swansea and South Wales area. If you're looking for something to make your party go with a bang, then look no further! presentations, Stag and Hen nights, weddings and many, many more! 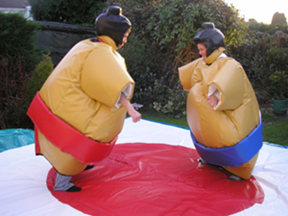 We now provide childrens sumo suits suitable for children aged 6-12. Prices start from £70 per day, please contact us for more details. We can supply the sumos for any kind of event - they were recently used in a pantomime at the Princess Royal Theatre, Port Talbot (click here to see the pictures).